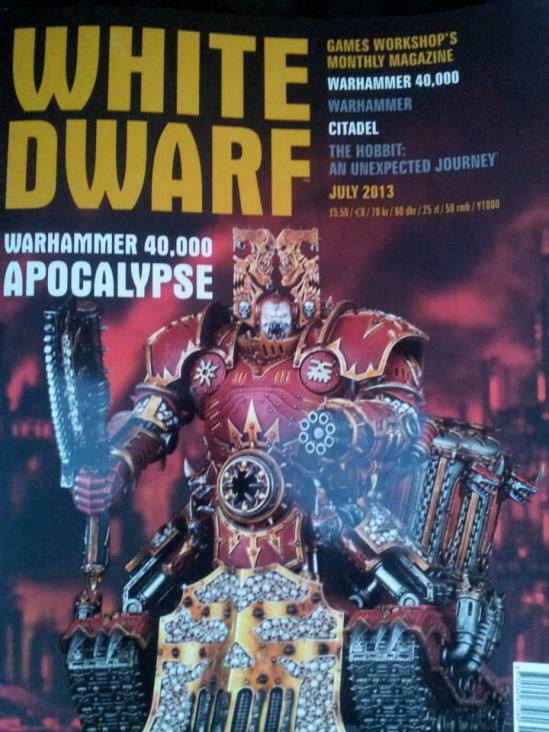 Apocalypse is confirmed for 6th edition too. After the very good Eldar models that were released recently, I’m fairly surprised that this is such an ugly model (and not in a good way). It looks far too chunky and to be honest and goofy as hell, so I’m hoping its just a bad shot and the model itself is much better built than the picture indicates. More intrestingly, the cover confirms what people have been suspecting for quite a few months now, that Apocalypse will be re-released with 6th edition in mind. Now I quite liked Apocalypse before, even if it was just really formalizing the rules for big games by saying ‘just do what you want!’. If its a White Dwarf update then I may buy it, but unless it really does bring something new to the game, I’m not shelling out another £30-£50 on a book that is a glorified update. Having just got the new Eldar book and seeing the way that they have updated a whole bunch of codex’s this year I’m quite hopefully about this. I have really enjoyed appocolips games in the past and with the relative balance of lots of new books at once it will solve some of the irritating issue of units with rules from different iterations of the meta game. I really do hope they do something good with apocalypse myself Peter. Its just that they need to be a bit tighter with the rules this time. Making a book that is the rulebook for fighting big games in the 40k verse and then saying “the only rule is there are no rules” annoyed me a little. Still, apocalypse games are fun as long as you have people to play who are in the same mindset. Same as inquisitor really!